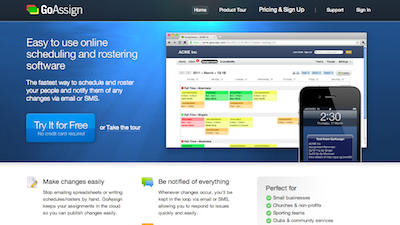 GoAssign is an online scheduling and rostering application for organizations and groups. Simple and easy to use it allows you to assign your people to assignments, shifts, sessions, or whatever you want to call them. With great features such as email and SMS notifications, assignment confirmations, unavailability, swapping and giving of assignments, conflicts and reminders, your people will never be out of the loop again while making your life easier. GoAssign beats the competition with it’s advanced notification system, user friendly calendar-like interface, automatic reminders and pricing as low as 25c/person per month! Previous post: Welshare.com – Share. Stay Informed.